Sending an encrypted email via Gmail is an effective way to increase security. You can make sure that reception of your email is restricted to some people. Now, there is another type of encryption that allows you to set a password as well. Just so you know, we are not talking about the HTTPS Encryption offered by Gmail and other providers. We are talking about using an extra encryption technology for advanced protection. Using this technique, email messages become encrypted and readable only by the intended recipient. For example, this tutorial to send encrypted emails has been tested on Gmail. It means that you can use this guide to send encrypted email in Gmail. By using this method, you have two layers of security one offered from Gmail and the third-party encryption we are now using.Now, to the step-by-step tutorial for sending encrypted emails in Google Chrome. Before we begin, there are a few things to be noted. There is an extension called Secure Mail for Gmail. Both the sender and recipient need to install the extension in their Chrome browser. Otherwise, the encryption-decryption process won’t work. So, if you want your friend – only your friend to access the encrypted email you’re sending, the friend has to install the extension first. Otherwise, he’d end up reading a meaningless combination of characters. To get things in flow, you have to install Secure Mail for Gmail extension from Google Chrome Webstore. You may follow the link given above to lead to the extension page. Just so you know, Secure Mail for Gmail is a pretty lightweight Chrome extension. You can finish installation in no time. 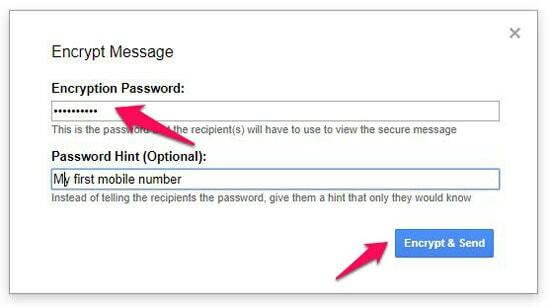 Now, you can open Gmail using the account from which you want to send encrypted email. Right next to the ‘Compose’ button, you can see another button, with the symbol of a Lock. Click on the Lock symbol to start creating an encrypted email. In a second, you can see a not-so-normal Compose window within the Gmail interface. It says that you are creating a Secured email message. Everything else is the same. So, now, you can add details such as the recipient, subject and content of the email message. Once you have finished composing the email, you can hit the Send Encrypted button. In a second, you can see a pop-up, asking you to enter the password. You can keep this password as simple or as tough as you want. The extension also lets you leave a password hint. After providing the password, you can press the button named Encrypt and Send. Note: Now, technically, you have sent the encrypted email to the intended receiver. And, the recipient now has to decrypt and access the email message. A few steps are involved there too. Before you do begin, make sure that Secure Mail for Gmail is installed in the recipient’s Chrome browser as well. When you open the message in the other account, you can see something like the following screen. On a normal day, you’d understand nothing from the content, since it’s all encrypted. Nonetheless, provided that you’ve installed the extension, you will see a button named Decrypt message with password. Click on that button to continue. In this step, the extension will ask the sender to enter the password. You have to enter the password and click the ‘Decrypt’ button to decrypt the encrypted mail. After you have decrypted, you may access the content like you do with a normal email message. In a second, you can see the actual email content along with a success message. So, this is how you send encrypted mails in Google Chrome, from Gmail. It can be used in a variety of instances and for different needs. You probably know the answer, because this method enhances the total privacy and security of the message you are sending. A person should not only have access to the recipient’s email account but also understand the encryption password to open the email content. It’s like having multiple password system but in a quite convenient manner. Suppose there is a group email ID that a lot of people have access to. But, you want only a particular person to access the actual content of the email. You can use the Secure Mail for Gmail extension in this scenario, where you can limit the access to people who know the password. On the other hand, if you think the HTTPS security offered by Gmail isn’t enough, this method is a viable alternative. Sending Encrypted Mails via Gmail – How Does it Work? As mentioned earlier, we are using a third-party solution for encrypting the messages that you are sending in your Gmail message. This works only if the recipient uses Gmail for mail management. As the title of post says, the method lets you send encrypted mails in Google Chrome since there is no scarcity for productive Chrome extensions, at this point of time. The way this encryption work is very simple to understand. Once you have written the message that you want to send, you will be encrypting everything using a unique password. This password is required to decrypt the message into normal text. We hope you understood the basic concept here. The sender sets a password for the message and the receiver needs to enter the same password for accessing the email message. We are using a third-party Google Chrome extension for this purpose namely Secure Mail for Gmail. It is completely free to use and you can find it on Chrome Web Store. In case you are doubtful about authenticity, keep in mind that Secure Mail from Gmail is from Streak. It’s a wonderful extension that converts your Gmail inbox to a fully-fledged CRM interface. So, don’t you think this solution on how to send encrypted emails in Google Chrome is helpful enough? Above, we have covered almost everything you should know about sending encrypted emails from a Gmail account — using an intuitive extension. This is also one of the best Gmail tricks you can now check out, as a method to send emails with extra security. Currently, the extension is available for Chrome and Gmail only, and we will update the article upon the launch of other options. Meanwhile, do you know any other solution to send encrypted and secured email from Gmail? Let’s have a talk in the comments.